We are once again preparing for my fall class – ANTH 3130: Excavating Hamline History. I teach this course every two years. 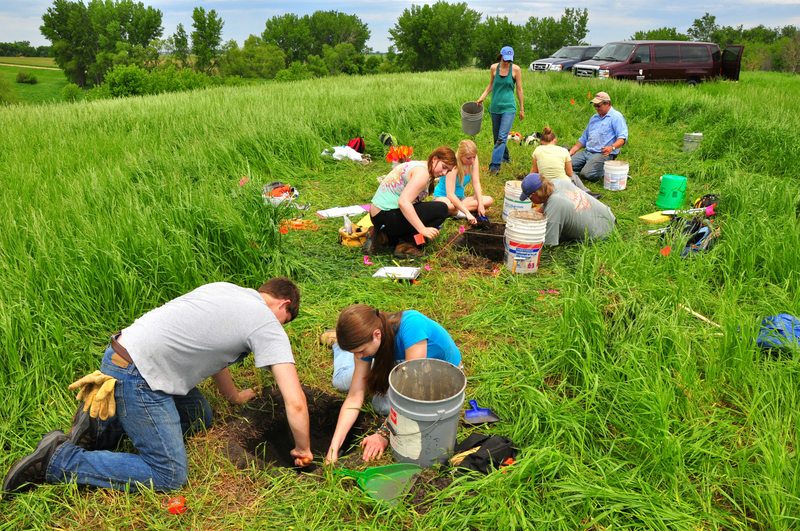 The course involves Hamline students from a variety majors and backgrounds engaged in a community archaeology and public history project. Archaeology is our focus. 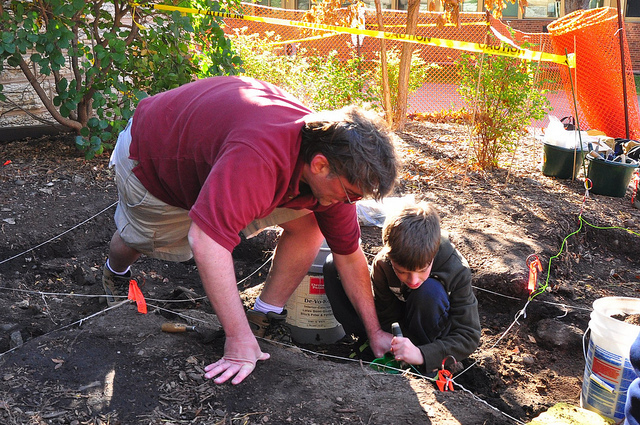 We will spend much of the semester excavating a site on campus or in the neighborhood. Students in the class participate in all stages of the work from site mapping to digging and screening to lab work and presenting our results. Each student also adds their own skills and knowledge to help us reach our broader goals. 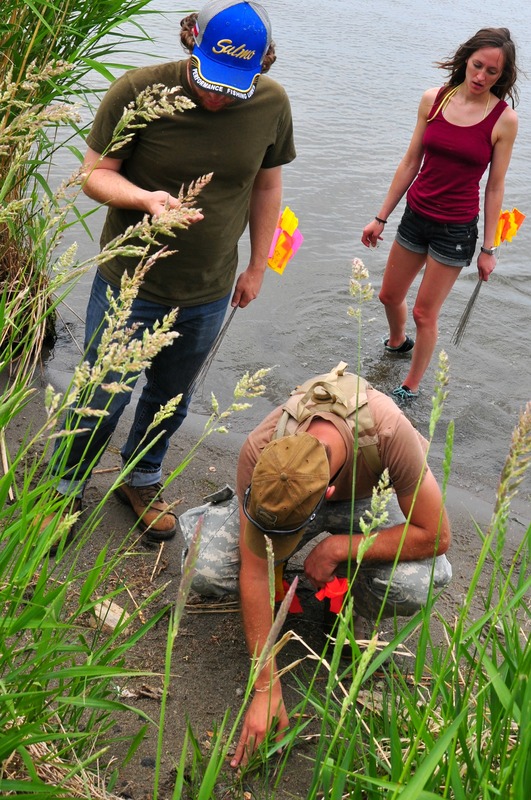 Archaeology students might work with GPS data to produce maps and illustrations. DMA students might build a website or app to help share our work with the public. 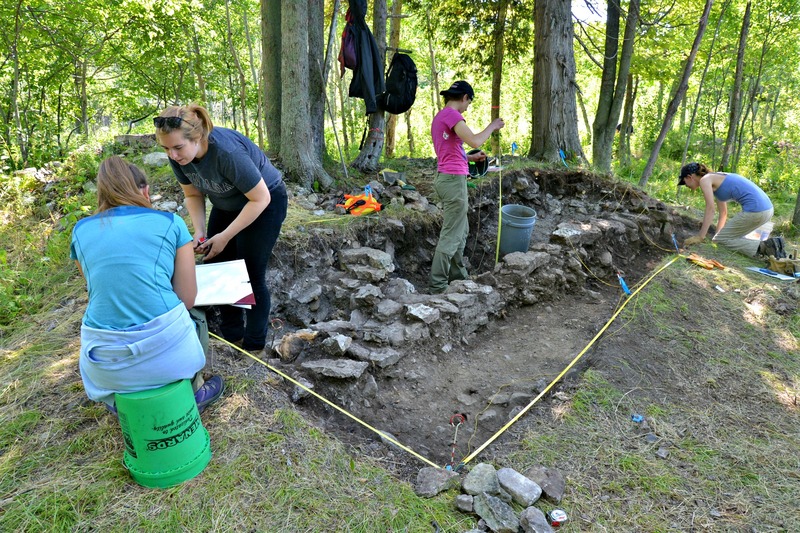 History majors can comb the archives to find the stories behind the sites we dig. Chemistry majors can analyze our brick samples with the department’s portable XRF to help us understand the material sources. The fact is, every Hamline student would be able to offer something of value to this interdisciplinary and collaborative endeavor. Check out this video link to hear some of my past students explain how the class works. 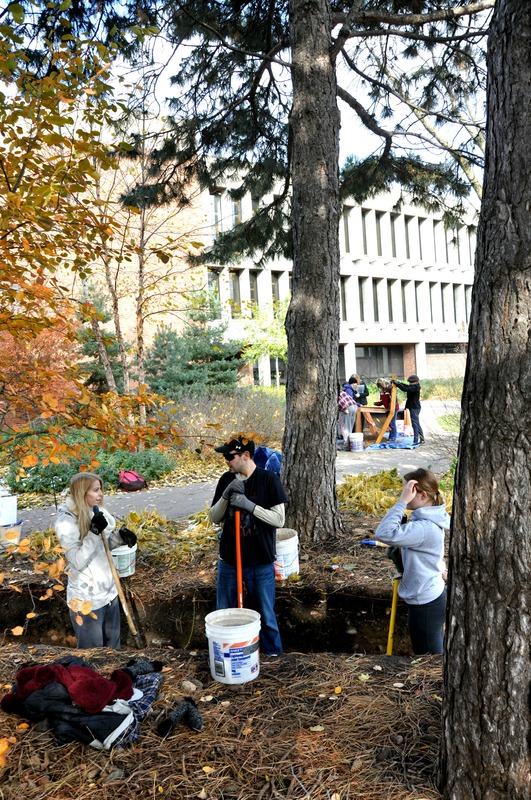 Students excavating the 830 Simpson Avenue Site in 2016. As you can tell, I don’t keep up with this blog, but it does have useful posts on our past excavations. Just click on the “Hamline History” category on the right panel to find these old posts. Students interested in getting “instructor’s permission” to register for my Fall 2018 class need to add a comment on this blog post. Your comment should include a little about your background (major, year, interests, skills), why you would like to take this class, and what ideas you have for contributing to the project goals. I’m looking for a mix of disciplines and skill sets to help with the interdisciplinary and collaborative aspects of the class. Most important to me, is finding students that are enthusiastic, ready to work hard, and eager for a non-traditional educational experience. Registration note: I recommend that everyone sign-up for a back-up class if your turn to register comes up before I have decided which of you to accept into this class. That way you can be sure to get into a course that you want. Excavating the Hall of Science site, 2013. It’s time for students to start registering for my next ANTH 3130: Excavating Hamline History class. This is by far my favorite class to teach and I’m excited about the plans for this fall’s excavations and research. 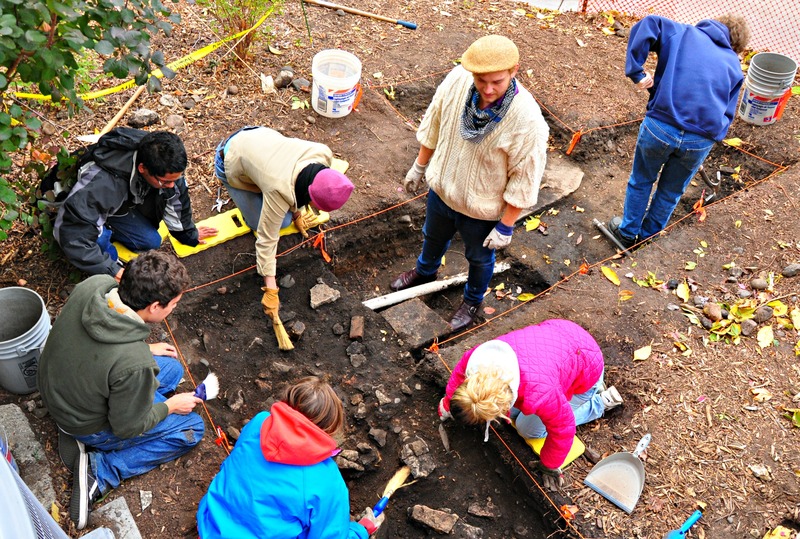 This class offers a unique opportunity to participate on an archaeological excavation as part of an interdisciplinary and collaborative project. It’s an interdisciplinary class because of the students. I ask each of you to contribute to the overall project goals based on either your major studies or other areas of interest and expertise that you have. Your contribution may be in a research area – where you apply your research skills to questions about the sites, or the artifacts, or the historical background. Over the years I’ve had a Chemistry major analyze brick mortar, an English major collecting oral history stories from people who grew up in the neighborhood, and a Business major studying the financial records from the University archives. Not all students collaborate through research. Our project incorporates the goals of public history and neighborhood archaeology – meaning that we seek to involve the entire Hamline-Midway community. I’ve had a Communications Study major develop a social media campaign to improve the public participation in our project, an Art major create a participatory art work that was particularly popular with families attending our public digs, and an Education major bring Hancock/Hamline Elementary students to join our dig. The point is, you can pursue just about any idea you want – from art to women’s studies. What you need is an ability to collaborate on the project’s goals, an enthusiasm for interdisciplinary methodology, and a willingness to connect with the community in the exploration of our neighborhood’s public history. It’s been a year since my last post. No real excuse for not blogging, just busy like everyone. I realize though that it is hard to have followers if I don’t write, so here goes. I just finished nine weeks of fieldwork on three different projects and am ready to start reporting on our discoveries. I began my 2014 field season on Kiska Island in Alaska working with an interdisciplinary team of nine students and scientists. I’ll be able to blog about National Science Foundation funded work once we get a field report done. 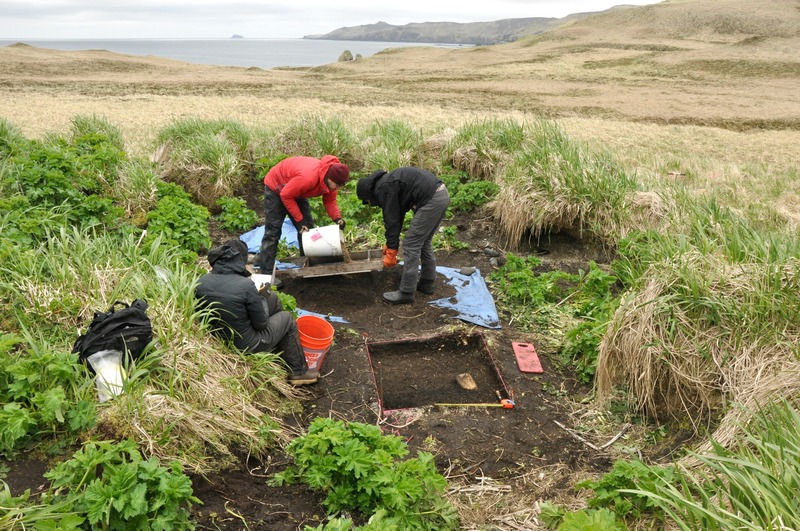 Steve, Hans and Megan excavating in a house pit on Kiska Island (Kiska 2014). A week after returning from Alaska, I joined a group of students and colleagues working on the Red Rock Ridge survey in western Minnesota. This survey is part of our Jeffers Archaeology Project. We have a Minnesota Legacy grant to look at rock art and habitation sites in the vicinity of the Jeffers Petroglyph site. I’m very excited about the results of this work. We walked a lot of prairie and found a number of sites. There’s even more work planned for this fall – we have been invited by a local farmer to survey their 300 acres along the Cottonwood River. The landowners showed us their artifact collection, so we know there are sites to be documented on this parcel. It should be fun. My third project was with James Myster of the US Fish and Wildlife Service. We just completed our second field season investigating a mid 19th century lighthouse on Plum Island in Lake Michigan. 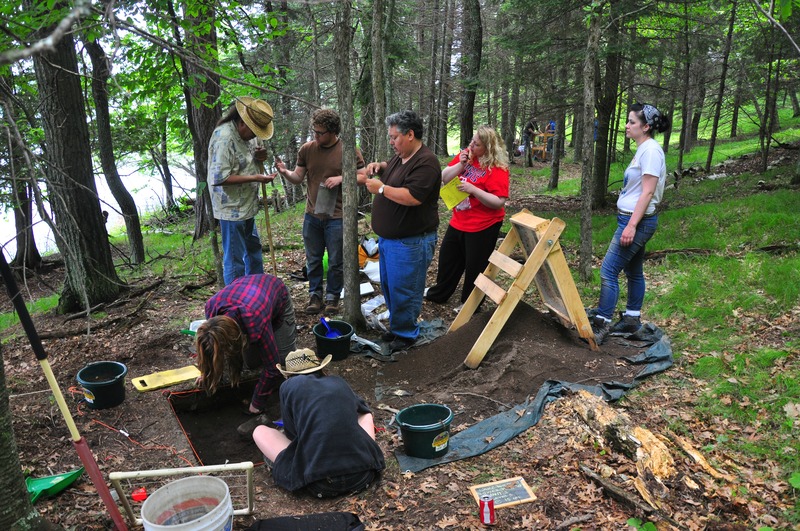 The combination of dedicated students, great scenery, fascinating archaeology, and welcoming ‘islanders’ combined to make this a particularly enjoyable field project – almost a vacation on the lake. I’m looking forward to posting on all these projects, but at the moment I’m late for the lab. Field school students with James Myster on Plum Island. 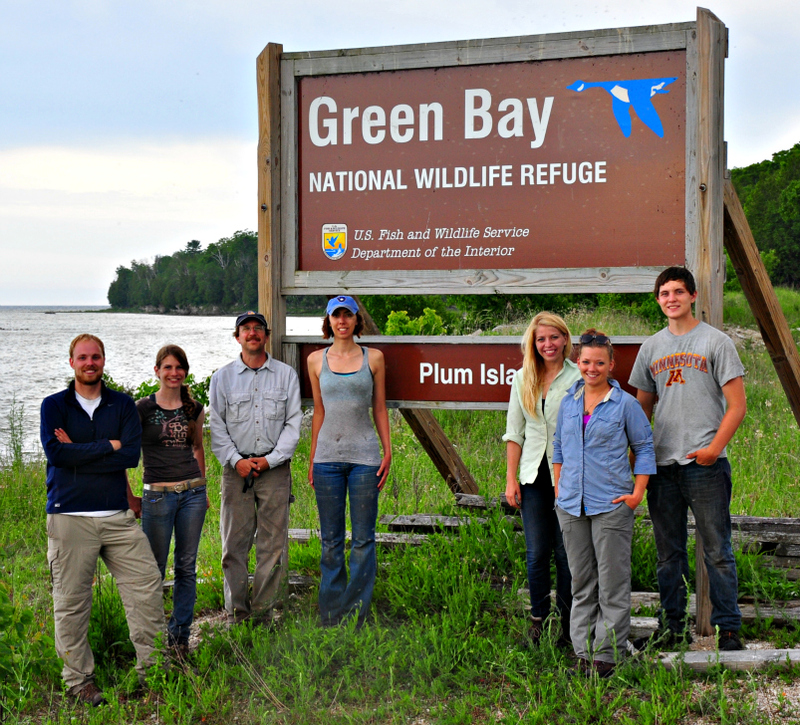 My field school moved from the prairie of western Minnesota to an island in the Great Lakes for our second project of the summer. We are collaborating with James Myster of the US Fish and Wildlife Service on his investigation of a lighthouse ruin on Plum Island just off the tip of Wisconsin’s Door Peninsula. Plum Island is on the infamous Porte des Morts passage or ‘Death’s Door’ – a waterway linking Green Bay and Lake Michigan. Ships traveling around the Door Peninsula preferred the short-cut south of Plum Island, but too frequently encountered dangerous conditions. More shipwrecks are found in and around Death’s Door than any other freshwater route in the world (Hoffmann 2003). The U.S. Lighthouse board decided the passage needed a light. They acquired Plum Island in 1848 with construction of a lighthouse completed in 1849 (Foss n.d.). The first lighthouse keeper, William Riggins, lived in the lighthouse with his wife and three children until 1857. The Port des Morts light, however, was placed too far west. Navigators complained and a new lighthouse was built in 1858 on nearby Pilot Island. Once abandoned, the Plum Island light quickly fell into ruins, with its roof collapsing by 1863. A postcard of the ruin dated to around 1907 shows tall walls of rough limestone blocks with openings for windows. The walls were mostly collapsed piles of rubble by the time we arrived on the site. 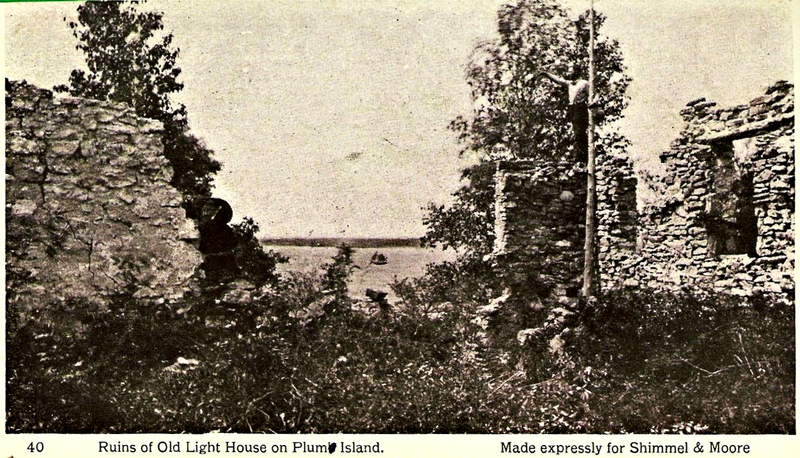 Post Card of Old Plum Island Lighthouse (a note written on the post card was dated to 1907). Old Plum Island Lighthouse Ruins in 2013. View of the northwest corner. First of the field school day – starting to excavate the trench through Feature 2 at the Gruenig Site. My 2013 archaeology field school has begun. We spent our first week in southwestern Minnesota where we are working with Tom Sanders and Chuck Broste on the Jeffers archaeology project. Our Monday morning start was slowed by the missing Hamline van. It was off for maintenance and no one knew when it would be ready. Fortunately we were only delayed a few hours, leaving us enough to time to get to Jeffers by early evening. I like this time of day best because the low angle of the sun makes the petroglyphs really pop. We were lucky to be able to see the site with Tom Sanders as our tour guide. He always gives the students a great introduction to our project. Rock art at Jeffers. 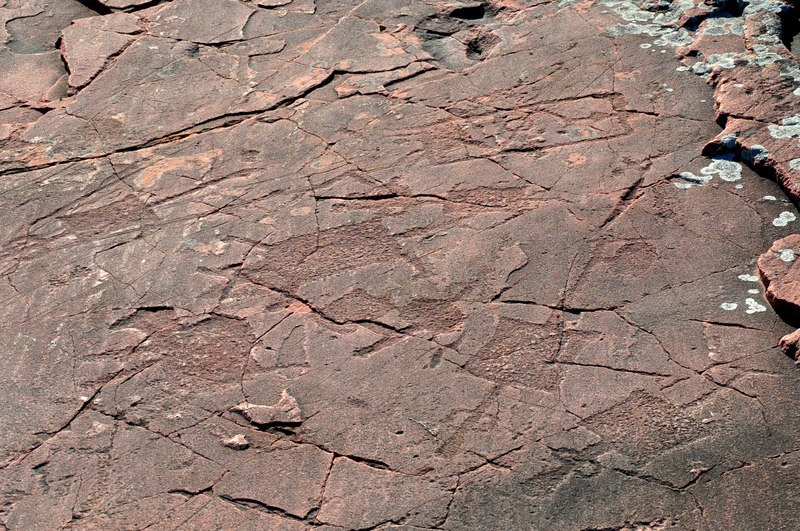 The two squares in the lower left are atlatl images. Tom Sanders, MHS site manager, offering his insight on the rock art. This post is for Hamline students interested in registering for my fall class ANTH 3130: Excavating Hamline History. Your contribution may be in a research area – where you apply your research skills to questions about the site, or the artifacts, or the historical background. The first time I taught this course we excavated Hamline University’s original Hall of Science, a three story brick building constructed in 1887. A chemistry major in the class analyzed the chemical composition of the building’s bricks, a history major collected oral history accounts from alumni and faculty, an economics major analyzed 125 year-old bills and receipts from the building’s construction, and an archaeology student analyzed the distribution of glass artifacts recovered in our excavations. Other students contributed by presenting and interpreting our project in various media including designing a web site, filming a video, writing a play, printing posters, and putting together an exhibit. We also had an education major that brought over Hancock 6th graders so they could experience archaeology first hand. Our philosophy major examined the ethics of archaeology. And our environmental studies major looked at the intersection of environmental protection and cultural resource management laws. Max and Mike excavating at Old Main. Meaghan (in red shirt) and her public art project (Fall 2011). through their work in community and University organizations and in media relations. The last time I taught the class, an art student created a participatory art project – where people could help paint a picture of University Hall (the predecessor to Old Main) while we dug the site. The point is, you can pursue just about any idea you want – from art to women’s studies. 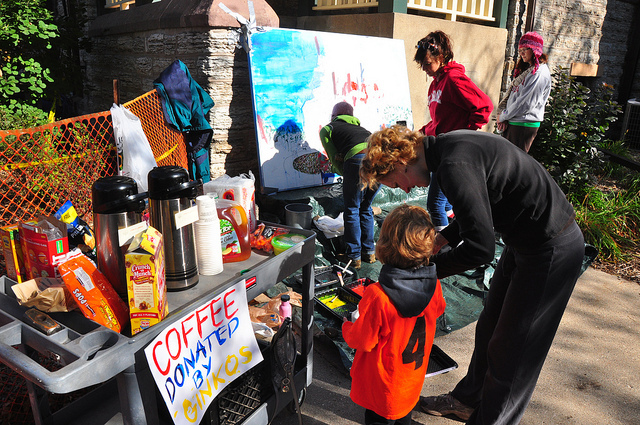 What you need is an ability to collaborate on other people’s projects, an enthusiasm for interdisciplinary research, and a willingness to connect with the community in the exploration of our neighborhood’s public history. Our muddy trench at the 2009 Church site dig. In addition to your own projects, you will be expected to participate in the fieldwork – which means you’ll be working outside on a sunny afternoon in September (which is a lot of fun), but you’ll also be working outside on a snowy day in November (which can be a little cold and muddy). Each student is also expected to help with our community outreach. You will need to be available for at least one Saturday during September and October. I don’t yet know what sites we’ll be digging this fall. I’d like to continue our excavations of the Territorial Road. I’d also like to do some more ‘backyard’ sites. The vacant lot north of Hewitt on the east end of campus used to have several houses – so there’s a lot of backyard to dig just on campus. Other campus sites we might dig include a fire station located near the Drew Fine Arts building, Old Main, and (if we can find it), the farmstead that pre-dated the Hamline campus. If this sounds interesting then write a brief comment to this post outlining what ways you could contribute to this fall’s class. Also tell me a little bit about yourself (including your major and year). Finally, I would like to know why you are interested in joining the class and what you hope to gain from your participation. You may want to look at posts tagged as “Hamline History” to get a better idea of what this class is all about. You can find these posts by clicking “Hamline History” under Categories on the right side of this blog. In particular, you may want to check out what students wrote when I offered the class in 2009 and 2011. If you take this class be prepared for a challenge, some fun, and a non-traditional educational experience. Registration note: I recommend that everyone sign-up for a back-up class if your turn to register comes up before I have decided which of you to accept into this class. Field school students working with Jim Jones and Tom Ross on the Lake Roosevelt excavations. Our first week of field school was spent learning how archaeology is practiced in the world of cultural resource management. For our second week we learned a little about archaeology and communities – archaeology and museums – archaeology and the public. The highlight of the second week was all the different people that we met. 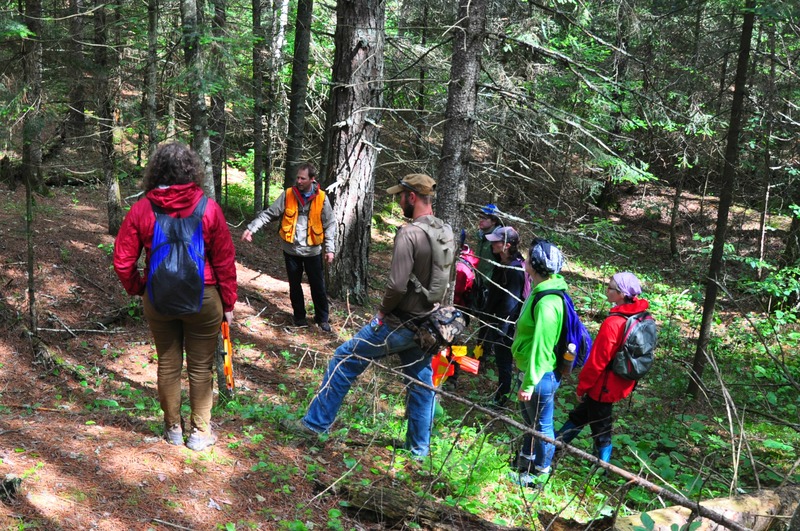 Forest Survey with DNR archaeologist Mike Magner. 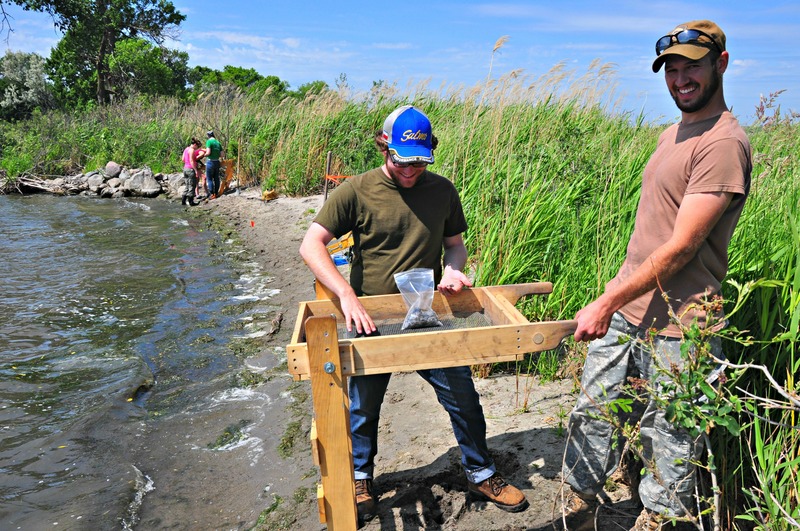 Kyle and Ian screening the beach sands for artifacts and bone. 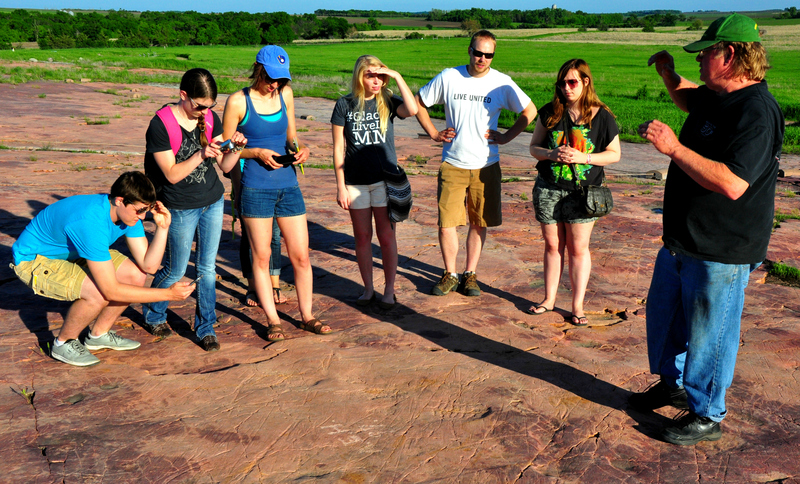 My 2012 archaeology field school is off to a productive and fun start. Our first week we collaborated with Garret Knudsen of Summit Envirosolutions on a survey of Lake Traverse on the Minnesota/South Dakota border. The goals of the project include surveying new sites, examining some of the known sites, and assessing the erosional impacts to those sites along the water’s edge. The Army Corp asked for this survey because they manage the water control dams on the Lake Traverse watershed. The raised water levels resulting from these dams are responsible for potentially significant damage to the cultural sites along the shores of Lake Traverse. Highlights from our first day’s finds include grit tempered ceramic sherds, a beautiful KRF point, and an bison tooth fragment. Kyle, Ian, and Sarah surveying beaches on Lake Traverse. Last fall, my students and I helped Garrett Knudsen of Summit Envirosolutions with a small survey project along the Orwell Reservoir near Fergus Falls, Minnesota. Garrett found a nicely made Knife River Flint point in a road track. 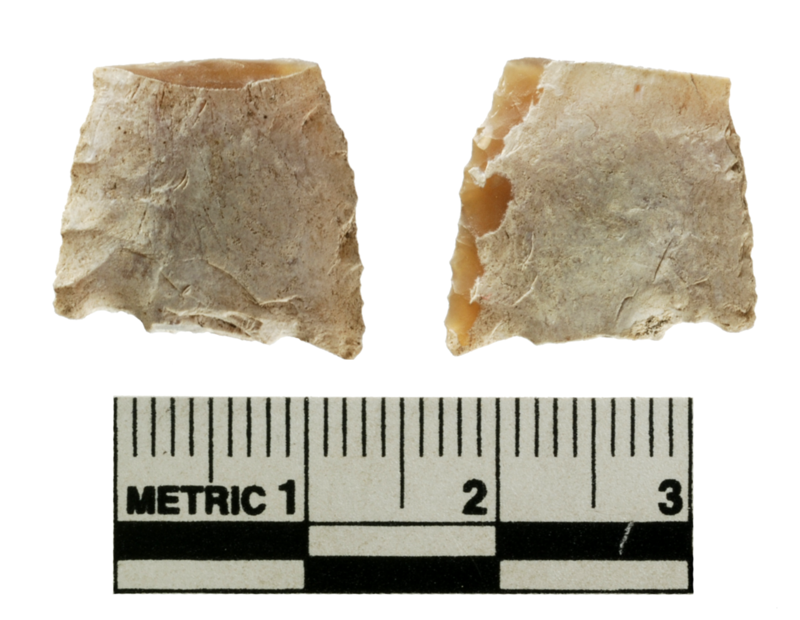 This find has got me thinking about recycling of lithics in prehistory. The point is broken at the tip and base. It’s hard to identify it to a formal type given that the base is missing, but it was either stemmed, side-notched, or more likely corner-notched. What makes this artifact particularly interesting is the heavy patina that covers much of its surface. This white coat is the result of ‘silica dissolution’ and is a kind of weathering common on KRF artifacts (VanNest 1985). The patina on this point tells a very interesting story – a story about old breaks and new breaks, of resharpening and recycling. Click below for the story and a bit of reminiscence of a Yup’ik elder. I apologize for my long absence. Teaching and life have some how managed to keep me a little too busy lately. I always have ideas for my blog – stories I want to write, links I want to discuss, and pictures I want to post. I just need to get back into the habit of writing. 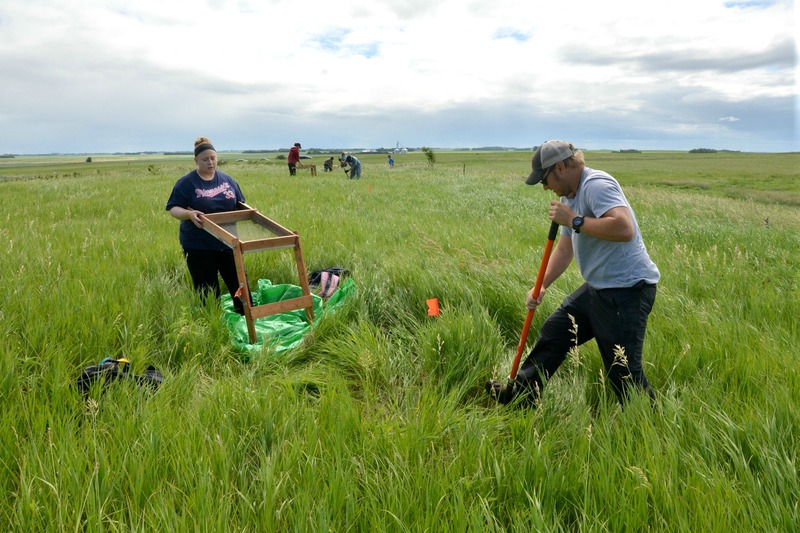 First I plan to get to the backlog of stories – what happened with the Hamline History dig (we found what we were looking for! ), other work in Minnesota (cool story on recycling of points and a Bicentennial party), my ‘ethnoarch’ explorations in Thailand and Cambodia (lots of cool pictures and video), and my Alaska research. The Aniakchak report is my immediate focus. I have a few months to write two chapters and edit the other chapters. I thought I’d post the opening two paragraphs of the report – just to help get me back into report-writing mode. High atop a rocky headland overlooking Aniakchak Bay sits a long abandoned village. For several centuries beginning around AD 400, this village was the home of an Alaskan native community. The residents of this site left behind a rich archaeological record of their daily lives. 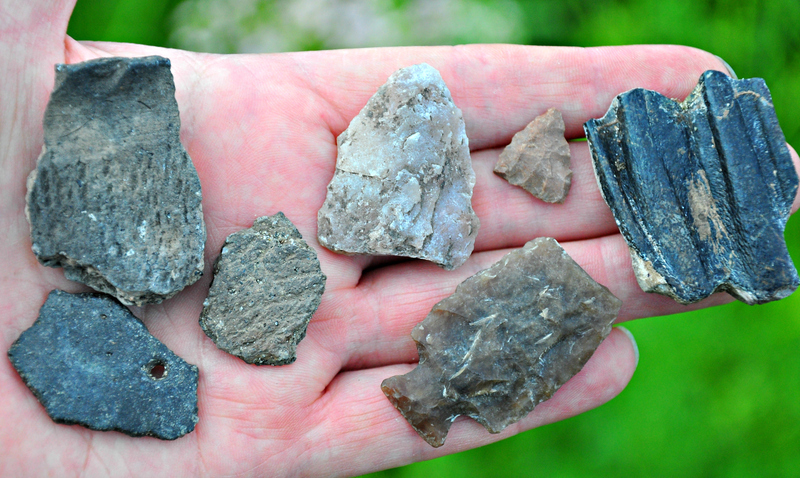 Stone projectile points and butchered animal bones attest to their skill in hunting. Delicate bone needles clustered around a fire hearth hint at the work of seamstresses and of the beautifully decorated clothing they must have made. A deciduous “baby” tooth tells us the obvious – that there were children in the village. One can imagine them helping a grandparent collect mussel shells from the reef in front of the site or playing with the other children down by the stream. Jet beads, a small whale figurine, and stones incised with geometric designs illustrate the villagers’ artistic traditions (Figure 1.1). Artifacts of copper, amber, ivory, slate, and obsidian document they did not live in isolation, but traded and traveled throughout the region. 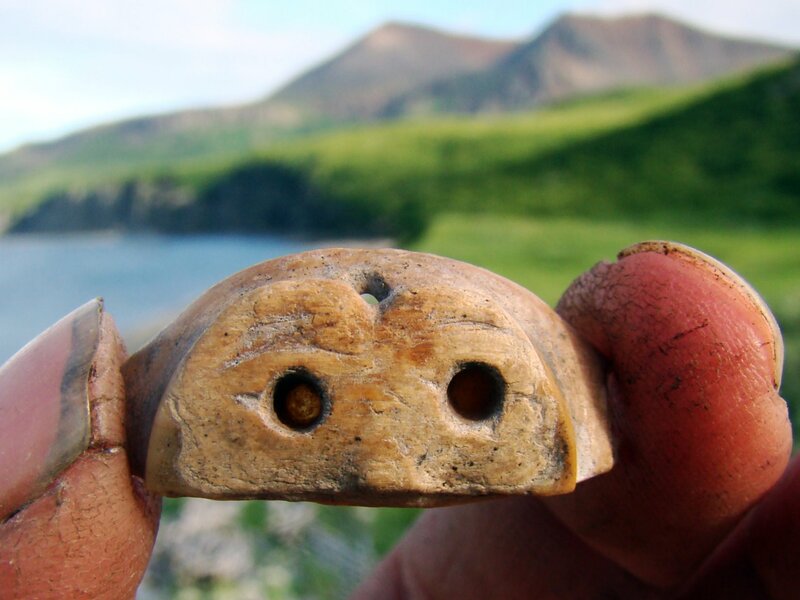 The first ‘Aniakchak’ villagers repeatedly used this site for 400 to 500 years. The location was undoubtedly one of the community’s principle residential sites based on the abundance and variety of food remains and cultural debris they left behind. After AD 900 the site was only rarely visited until a new community made it their home sometime around AD 1400. The occupation of the more ‘recent’ community was less intense and probably of shorter duration compared to the earlier village. 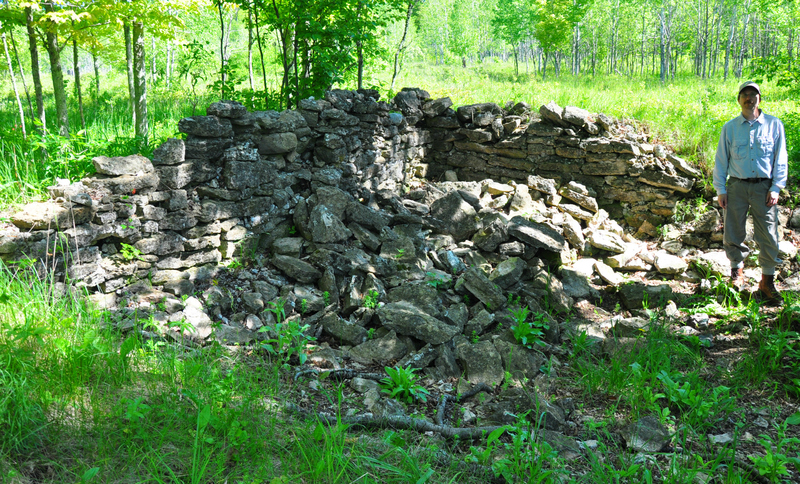 The lack of glass beads or other fur trade goods tells us that the younger village was abandoned prior to the mid 18th century arrival of Russian fur traders in the north Pacific.